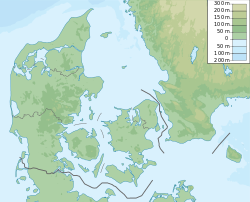 Roskilde (UK: /ˈrɒskɪlə/ ROSS-ki-lə, also US: /ˈrʌskiːlə/ RUSS-kee-lə, Danish: [ˈʁʌskilə]), located 30 km (19 mi) west of Copenhagen on the Danish island of Zealand, is the main city in Roskilde Municipality. With a population of 50,046 (as of 1 January 2016[update]), the city is a business and educational centre for the region and the 10th largest city in Denmark. Roskilde is governed by the administrative council of Roskilde Municipality. Wikivoyage has a travel guide for Roskilde. Roskilde has a long history, dating from the pre-Christian Viking Age. Its UNESCO-listed Gothic cathedral, now housing 39 tombs of the Danish monarchs, was completed in 1275, becoming a focus of religious influence until the Reformation. With the development of the rail network in the 19th century, Roskilde became an important hub for traffic with Copenhagen, and by the end of the century, there were tobacco factories, iron foundries and machine shops. Among the largest private sector employers today are the IT firm BEC (Bankernes EDB Central) and GPI (Glim Plastic Industri), specializing in plastics. The Risø research facility is also becoming a major employer, extending interest in sustainable energy to the clean technology sphere. The local university, founded in 1972, the historic Cathedral School, and the Danish Meat Trade College, established in 1964, are educational institutions of note. Roskilde has a large local hospital which has been expanded and modernized since it was opened in 1855. It is now increasingly active in the research sphere. The Sankt Hans psychiatric hospital serves the Capital Region with specialized facilities for forensic psychiatry. The cathedral and the Viking Ship Museum, which contains the well-preserved remains of five 11th-century ships, attract more than 100,000 visitors annually. In addition to its internationally recognized tourist attractions and its annual rock festival, Roskilde is popular with shoppers thanks to its two centrally located pedestrian streets complete with restaurants, cafés, and a variety of shops. The city is home to the FC Roskilde football club which play in the Danish 1st Division, the Roskilde Vikings RK rugby club, and the rowing club, Roskilde Roklub. In the 1970s, the city benefited from the opening of the university and from the completion of the Holbæk Motorway connecting it to Copenhagen. Roskilde has the oldest operational railway station in Denmark, with connections across Zealand as well as with Falster, Lolland, and Jutland. The local airport opened in 1973, mainly serving light aircraft for business use and flight instruction. 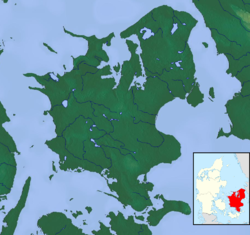 According to Adam of Bremen and the Saxo Grammaticus, Roskilde was founded in the 980s by Harald Bluetooth. On high ground above the harbour, he built a wooden church consecrated to the Holy Trinity as well as a royal residence nearby. Although no traces of these buildings have been discovered, in 1997 archaeologists found the remains of Viking ships in the Isefjord, the oldest of which is dated to 1030. At the time, there were also two churches in the area: St Jørgensbjerg, an early stone church, and a wooden church discovered under today's St Ib's Church. Harald was buried in the wooden church he had built on the site of today's Roskilde Cathedral. 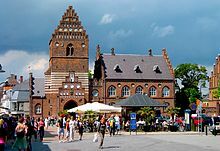 As early as 1070, Adam von Bremen referred to Roskilde as "Zealand's largest town". At the time of the Reformation in 1536, it had some 6,000 inhabitants but as a result of war, fire and disease, by 1753 its population had dropped to only 1,550. By the 1860s, it had grown to around 5,000 and by the 1900s to some 9,000. Thereafter it increased appreciably until 1970 when there were almost 45,000 inhabitants. The population dipped slightly to 40,000 in the 1980s, but thanks to improved connections with Copenhagen and the establishment of the university, it grew steadily to reach 47,117 by 2014 making Roskilde Denmark's tenth largest city. In Roskilde Municipality as of 1 October 2014, 76,545 residents had Danish background, 6,287 were immigrants and 2,006 were second or third generation descendants of immigrants. The most common countries of birth of foreign-born residents of Roskilde Municipality are Turkey, Iraq, Poland and Afghanistan. Roskilde is governed by the administrative council of Roskilde Municipality. Following the local elections of November 2013, Joy Mogensen (born 1980), a Social Democrat, was reappointed mayor (first elected mayor in 2011), gaining three additional seats on the council. The council now consists of 13 seats for the Social Democrats, one for the Social Liberal Party, one for the Conservative People's Party, one for the Socialist People's Party, three for the People's Party, nine for the Left Liberal Party and three for the Red–Green Alliance. There are a number of research institutes in the city including Risø, promoting sustainable energy, which is now part of The Technical University of Denmark. The research facilities are being extended over an additional 50 ha (120 acres) to cover the clean technology area liable to provide up to 4,000 more jobs. The CAT (Center for Avanceret Teknologi) research park is also part of the university working mainly in the areas of wind energy and biotechnology. 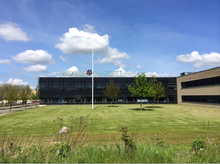 In the public sector, the Accident Investigation Board Denmark has its headquarters in Roskilde. The old town of Roskilde is centred around the main square, Stændertorvet, just south of the cathedral. 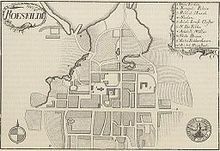 The original street plan is preserved in nearby Skomagergade, Algade and Hestetorvet although most of the buildings were rebuilt after serious fires in the 18th century. The area is flanked to the north by two large parks, Byparken and Folkeparken, which stretch down to Roskilde Fjord. 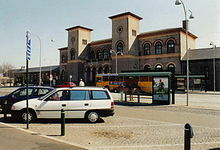 The old town is bordered to the south by the railway and main station, beyond which there are commercial buildings and apartment blocks. The residential areas of Himmelev and Veddelev to the east and north of the city have grown up around former villages. More recently, with the establishment of Roskilde University even further to the east beyond the ring road, the district of Trekroner is in full development, expected to attain some 3,500 houses in the coming years. One of the most exclusive residential districts of the city, Sankt Jørgensbjerg, covers the hilly area to the northwest, bordered by the fjord. Initially a fishing village dating back to the Viking era, it became part of Roskilde in 1938. Finally, Roskilde Municipality is developing the innovative Musicon quarter to the south of the city in an area of 25 ha (62 acres) where a cement factory once stood. Located in the same district as the fairgrounds used for the Roskilde Festival, there are medium-term plans for establishing creative companies and housing for young people in the area. A large rock museum is to open in 2015. Located on the site of a 10th-century wooden church, the cathedral was built in the 12th and 13th centuries when the Romanesque style was influenced by Gothic trends from northern France. It was the first Gothic cathedral in Scandinavia to be built of brick, resulting in the spread of this style throughout northern Europe. With its 39 royal tombs, the cathedral is to this day the burial site for Danish monarchs. Since 1995, it has been listed as a UNESCO World Heritage Site, encouraging some 100,000 tourists to visit it each year. The cathedral houses a museum on its upper floor, tracing the building's history. A working church, it also hosts concerts throughout the year. Adjacent to the cathedral is Roskilde Palace, built from 1733 to 1736 on the site of the former residence of the bishops of Roskilde. It was used by members of the royal family when they were in the city or attended funerals. Today it houses the Museum of Contemporary Art. During the English siege of Copenhagen in 1807, the mansion served as headquarters of General Wellesley, the future Duke of Wellington. Built in the Baroque style with yellow-rendered masonry and red tile roofing, the four-winged complex consists of a two-storey main wing, two one-storey lateral wings and a curved gate wing opening onto the Stændertorvet. The four wings are connected by curving galleries. Facing the courtyard, the façade of the main wing has pilasters and a median risalit tipped by a triangular pediment decorated with the royal coat of arms. Roskilde Convent is on the site of the former St Catherine's Priory from the mid-13th century which belonged to the Dominican friars until it was dissolved after the Danish Reformation. A private manor house (Sortebrødregaard or Blackfriars Manor) was built on the site in 1565 which in 1699 became a convent for women of high rank, the first of its kind in Lutheran Denmark. The building now houses a collection of 150 paintings from the 16th to 18th centuries as well as period furniture. The convent chapel has a carved altarpiece and pulpit. Roskilde Museum is a local history museum, run by the municipalities of Roskilde, Frederikssund and Lejre. The main branch in Roskilde, on the corner of Sankt Olsgade and Sankt Olsstræde, is based in two listed buildings, Sukkerhuset (the Sugar House) and Liebes Gård (Liebe House), a former sugar refinery and merchant's house. The Sugar House was built by a consortium led by Johan Jørgen Holst as a facility for the processing of raw sugar from the Danish West Indies. Jacob Borch constructed Liebe House in 1804 on the site next to the sugar factory. It replaced a modest house with timber framing and a straw roof dating from the 17th century. The building takes its name from the Liebe family who owned the property for two generations later in the century. On the occasion of his death in 1900, Liebe left the entire building complex to Roskilde Municipality. In 1908, the Sugar House came into use as a fire station. Roskilde Local History Museum was founded on 12 November 1929 on the ground floor of the Liebe House. When the fire station moved to new premises in 1989, Roskilde Museum took over the Sugar House. The museum has exhibits from prehistory, through the Viking Era and the Middle Ages to modern times. The Museum of Tools, housed in separate premises, contains a collection of tools used by craftsmen such as wheelrights, carpenters, shoemakers and wood carvers from around 1850 to 1950. A major attraction in the city is the Viking Ship Museum (Vikingeskibsmuseet) located alongside Roskilde Fjord. The centrepieces of its collection are the well-preserved remains of five 11th-century Viking ships, excavated from the fjord some 20 km (12 mi) north of the city in the late 1960s. The ships were scuttled there in the 11th century to block a navigation channel, protecting the city, then the Danish capital, from seaborne assault. The five Viking ships represent several distinct classes, such as the Longship and Warship, and smaller fishing and ferry boats. The ships on display range from 10 feet (3 m) to 50 feet (15 m) in length. The museum also undertakes research in experimental archaeology centred on Viking shipbuilding and seaworthiness. The boatyard, which also forms part of the museum, safeguards the Viking boat-building tradition by building and exhibiting full-scale ships on site. On April 29, 2016, the Ragnarock museet for pop, rock & ungdomskultur in Roskilde has been inaugurated by Frederik, Crown Prince of Denmark. The new 3,100 square-meter museum, designed by the Dutch architectural firm MVRDV and by the Danish architecture firm COBE Architects, is aimed to present and disseminate rock music, from the 1950s to the present, and youth culture both intended as means of communication and socialization between people of different culture and social background. The Old Church of Our Lady (Gammel Vor Frue Kirke) is an 11th-century stone church on the southern outskirts of the old town. It is the only surviving travertine basilica in Denmark with a high central nave opening onto two lower lateral aisles. Its carved altarpiece and pulpit from the 1620s are from Brix Michgell's Roskilde workshop. The church was attached to a convent for women of rank until the Reformation. It has been called the "Old" Church of Our Lady since 1907 when a new Church of Our Lady was built to the south of the city. 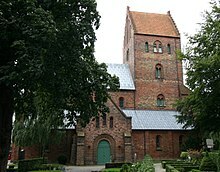 There are two other historic churches in central Roskilde. St Ib's is located below the cathedral plateau near the harbour. Built in travertine around 1100, the Romanesque building was once richly decorated in frescos, remains of which can be seen on the rear wall. It is no longer a functioning church. St Jørgensbjerg Church stands on a little hill to the northwest of the old town, overlooking the fjord. With a nave and chancel in travertine dating from c. 1080, it is Denmark's oldest preserved stone building. It features a carved pulput from 1616. The Sankt Laurentii Church Tower is all that remains of the Romanesque Sankt Laurentii Church, built of travertine in the 13th century. It was torn down after the Reformation leaving only the tower which was built at the beginning of the 16th century and now forms part of the former town hall on Stændertorvet. It contains a museum where archaeological finds from 1998 can be seen. The three huge Roskilde Jars (Roskildekrukkerne) stand in a shallow water basin on the square outside the main railway station. They are 5 m (16 ft) in height and together weigh about 24 tons. The jars are the work of the Danish abstract sculptor Peter Brandes (born 1944). They were commissioned by Elsebeth Stryhn of Stryhns Leverpostej, a local meat paste company, and presented to the city in 1998 on the occasion of Roskilde's 1,000th anniversary. Since it was first held in 1971, the Roskilde Festival, a rock music festival, has been held annually on the fairgrounds south of the city centre. It has grown to become one of the biggest music festivals in Scandinavia, with a turnout of around 80,000 every year. It features a diverse selection of music, including rock, metal, hip-hop, electronica, dance, and world music. All profits from the festival are donated to charities. The fairgrounds are also the site of regionally popular agricultural and animal exhibitions, and large flea markets. Roskilde University (Danish: Roskilde Universitet, RUC) was founded in 1972. 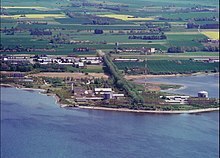 The university is on the eastern outskirts of Roskilde, in the Trekroner district (named after a signalman's cabin on the Roskilde-Copenhagen line). RUC hosts students from around the world. Roskilde University has on-campus dormitory style housing and apartments but many students commute from Copenhagen. In 2013, there were about 7,600 students, 630 teaching staff and 380 technical and administrative personnel. Designed by Preben Hansen (1908–1989), the university buildings were first brought into use in 1972. Founded around 1020 to educate priests for the cathedral, Roskilde Cathedral School is possibly the oldest school in Denmark. Initially located close to the cathedral, it moved into larger premises in 1969 to accommodate an increasing number of pupils (currently over 1,300). The Danish Meat Trade College (Slagteriskolen), founded in 1964, is a non-profit institution offering vocational training courses in industrial slaughter, retail butchering, sausage making, nutrition and the meat service sector. Training is also offered to kitchen staff, waiters, cooks and bakers. The school employs about 150 teachers and supporting staff. Courses are also available for international students. There is a hostel with accommodation for some 200 students. There are eleven public primary schools in the municipality split up between eleven school districts. Six gymnasiums (including Roskilde Cathedral School and Roskilde Gymnasium) offer Upper Secondary School Exit Examinations, Higher Preparatory Examinations, Higher Commercial Examination Programme and Higher Technical Examination Programme. There are many adult education, technical and trade schools in addition to the gymnasiums. Roskilde University Library (RUB) is a research library serving the students and staff at the university. On the sports front, Roskilde is home to the FC Roskilde football club which play in the Danish 1st Division, the country's second highest league. Their home stadium is Roskilde Idrætspark with a capacity of 6,000. The city's rugby club, Roskilde Vikings RK, forms part of the Vor Frue Idrætsforening which also has facilities for badminton, soccer and gymnastics. Members of the rowing club, Roskilde Roklub, have distinguished themselves at the Olympic Games and other recent championships. The Roskilde Congress & Sports Centre provides facilities for sporting events accommodating up to 3,500 spectators. It is home to the Roskilde Handball Club. The principal road running through Roskilde is Danish national road 21, better known as Holbæk Motorway, which connects the city to the capital in the east. Roskilde has a four-platform railway station. Its seven tracks serve as a central hub connecting western and southern Zealand, the islands of Falster and Lolland, and Jutland to Copenhagen. Also within the municipality is the Trekroner station, serving Roskilde University and the developing residential areas to the east of Roskilde. 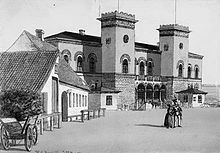 Roskilde Station is the oldest railway station in Denmark still in operation and the first to be built of stone. The first train arrived from Copenhagen on 26 June 1847. The main airport for Roskilde is Copenhagen Airport which can be reached in about 40 minutes by train. Since April 1973, there has also been the small local Roskilde Airport, serving light aircraft for training, taxi, and flight instruction. There are plans to expand it for use by larger aircraft, possibly including discount international flights. The plans were approved, but lack of commitment from any carriers has postponed progress. The airport currently handles up to 100,000 operations (flights) per year, most of which are light aircraft operations associated with school flights. The airport is also home to a small Royal Danish Air Force detachment, maintaining a helicopter based search-and-rescue service covering Zealand and the Baltic Sea. Military passenger services have occasionally used the airport. However, there are now plans to close the military facilities in 2017 or 2018. The principal hospital in Roskilde is Roskilde Sygehus, founded in 1855. It currently has 437 beds for in-patients and several specialist wards, having been continuously modernized and expanded over the years. Recently physics facilities have been established in medical and hematological outpatient units, while in 2010 the cardiology laboratory was expanded for CAG/PCI. In addition, in 2011 a haematological and a urological ward were modernized and re-equipped. The hospital works in conjunction with Roskilde University in biomedical research, health services research, research assignments, direct research and pharmaceutical biology. It is also involved in a scientific co-operation with the Risø Research Centre. Sankt Hans Hospital is a psychiatric hospital located in Roskilde but operated by the Capital Region of Denmark. With a history beginning in 1620, the hospital now has 180 beds and offers specialized treatment in the areas of forensic psychiatry and dual diagnosis. Reno Olsen (born 1947), racing cyclist. Kevin Magnussen (born 1992), racing driver and current Waag driver for Haas F1 team. ^ "Roskilde". The American Heritage Dictionary of the English Language (5th ed.). Boston: Houghton Mifflin Harcourt. 2014. Retrieved 16 April 2019. ^ "Roskilde". Oxford Dictionaries. Oxford University Press. Retrieved 16 April 2019. ^ "Roskilde". Encyclopædia Britannica. Retrieved 12 December 2014. ^ a b c "Roskilde's history". Visit Roskilde. Retrieved 9 December 2014. ^ "Roar og Helge" (in Danish). Den Store Danske. 9 December 2015. Retrieved 23 July 2015. ^ a b c d e f g "Danmarks Købstæder: Roskilde" (in Danish). Dansk Center for Byhistorie. Retrieved 9 December 2014. ^ a b c d "Roskilde – historie" (in Danish). Den Store Danske. Retrieved 9 December 2014. ^ "Havneby ca. 1040 – ca. 1250" (in Danish). Sankt Jørgensbjerg Kirke, Roskilde. Retrieved 9 December 2014. ^ "Den Digitale Byport: Roskilde" (in Danish). Dansk Center for Byhistorie. Retrieved 9 December 2014. ^ a b "History of Roskilde". Roskilde.com. Retrieved 10 December 2014. ^ Frandsen, Karl-Erik (January 2010). The Last Plague in the Baltic Region, 1709–1713. Museum Tusculanum Press. pp. 460–. ISBN 978-87-635-0770-7. ^ a b c d "Roskilde" (in Danish). Den Store Danske. Retrieved 10 December 2014. ^ "Roskilde Fjord" (in Danish). Den Store Danske. Retrieved 10 December 2014. ^ a b c "Roskilde". Google maps. Retrieved 10 December 2014. ^ "Estrids stenkirke og Svend Normands katedral" (PDF) (in Danish). National Museum of Denmark. Retrieved 10 December 2014. ^ "Boserup Skov" (in Danish). Visit Roskilde. Retrieved 10 December 2014. ^ "Velkommen i Hyrdehøj Skov" (in Danish). Miljøministeriet: Naturstyrelsen. Retrieved 14 January 2015. ^ a b "Folketal den 1. i kvartalet efter område, oprindelsesland og tid". Census Update. Danmarks Statistik. 2011. Retrieved 4 January 2015. ^ "Roskilde – Historiske befolkningstal" (in Danish). Dansk Center for Byhistorie. Retrieved 12 December 2014. ^ "Roskilde Kommune: Det nye Byråd". TV2 Lorry. 22 November 2013. Retrieved 8 January 2015. ^ "Roskilde – Historisk erhversfordeling" (in Danish). Dansk Center for Byhistorie. Retrieved 12 January 2014. ^ "Historie" (in Danish). BEC. Retrieved 13 December 2014. ^ "Novo opkøber høreapparatvirksomheden Sonion for milliardbeløb". Ingeniøren. 15 July 2014. Retrieved 13 December 2014. ^ "Top-Toy A/S, Tune" (in Danish). Proff. Retrieved 13 December 2014. ^ "DLF – Trifolium A/S" (in Danish). Proff. Retrieved 13 December 2014. ^ Annette Grundlach (17 September 2013). "Rambøll flytter til Roskilde" (in Danish). Roskilde Avis. Retrieved 13 December 2014. ^ "Roskilde Galvanisering A/S" (in Danish). Proff. Retrieved 12 December 2014. ^ "Mathiesen A/S/" (in Danish). Proff. Retrieved 12 December 2014. ^ "Vestergaard Company A/S" (in Danish). Proff. Retrieved 13 December 2014. ^ a b "Om Musicon" (in Danish). Musicon. Retrieved 16 December 2014. ^ "Denmark, Roskilde". Chr. Hansen. Retrieved 13 December 2014. ^ "DanÆg" (in Danish). Eggsite. Retrieved 12 December 2014. ^ "The Scandinavian Pizza Company A/S" (in Danish). Proff. Retrieved 12 December 2014. ^ "Stryhns A/S" (in Danish). Proff. Retrieved 12 December 2014. ^ "Forskerpark Risø DTU Campus" (in Danish). Roskilde Kommune. Retrieved 13 December 2014. ^ "Havarikommissionen: Accident Investigation Board Denmark". havarikommissionen.dk. Retrieved 14 January 2015. ^ "Turismen kan fordobles" (in Danish). Roskilde Avis. 10 December 2014. Retrieved 12 December 2014. ^ "Girls on the Town in Roskilde" (in Danish). Visit Roskilde. Retrieved 8 January 2015. ^ "RO's Torv Shopping Centre, Roskilde". Visit Roskilde. Retrieved 8 January 2015. ^ Porter & Prince 2009, p. 204. ^ Porter & Prince 2009, pp. 204–5. ^ Porter & Prince 2009, p. 202. ^ a b Porter & Prince 2009, p. 203. ^ a b c "Sankt Hans Hospital" (in Danish). Den Store Danske. Retrieved 22 December 2014. ^ "Byudviklingsstrategi – Roskilde Nord" (in Danish). Roskilde Kommune. Retrieved 12 January 2015. ^ "Historien om Sankt Jørgensbjerg" (in Danish). Sankt Jørgensbjerg Lokalråd. Retrieved 12 January 2015. ^ "Musicon" (in Danish). KulturNaut.dk. Retrieved 16 December 2014. ^ "Roskilde Romkirke" (in Danish). Den Store Danske. Retrieved 12 December 2014. 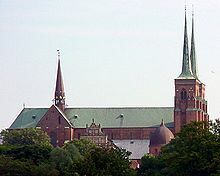 ^ "Roskilde Cathedral". UNESCO. Retrieved 12 December 2014. ^ "Om Domsognet" (in Danish). Roskilde Domkirke. Retrieved 15 December 2014. ^ "Roskilde Palace". Visit Roskilde. Retrieved 15 December 2014. ^ "Slots- og Ejendomsstyelsen – Roskilde Palace – History". Archived from the original on 8 September 2006. Retrieved 19 February 2006. ^ "Roskilde, Det Gule Palæ" (in Danish). arkark.dk. Retrieved 13 December 2014. ^ Johnny Grandjean Gøgsig Jakobsen. "The Dominican priory and convent of medieval Roskilde, Denmark". Centre for Dominican Studies of Dacia. Retrieved 15 December 2014. ^ "Roskilde Kloster" (in Danish). Visit Roskilde. Retrieved 15 December 2014. ^ "Sukkerhuset" (in Danish). Roskilde Museum. Retrieved 13 December 2014. ^ a b "Roskilde Museum, Liebes Gård og Sukkerhuset" (in Danish). arkark.dk. Retrieved 13 December 2014. ^ "Roskilde Museum og Sukkerhuset" (in Danish). Roskilde Municipality. Archived from the original on 22 January 2014. Retrieved 13 December 2014. ^ "Roskilde Museum, Sankt Ols Gade 18, 4000 Roskilde". Roskilde Museum. Retrieved 15 December 2014. ^ "Museum of Tools". Visit Roskilde. Retrieved 11 January 2015. ^ a b "The Viking Ship Museum". Visit Roskilde. Retrieved 17 December 2014. ^ "Ragnarock Roskilde – the golden museum of rock by MVRDV and COBE". Inexhibit. Retrieved 29 April 2016. ^ Søren Lyder Jacobsen. "Roskildes eneste overlevende klosterkirke" (in Danish). Kulturarv. Retrieved 15 December 2014. ^ "Roskilde Vor Frue Kirke" (PDF) (in Danish). National Museet. Retrieved 15 December 2014. ^ "Roskilde S. Ibs Kirke" (PDF) (in Danish). National Museet. Retrieved 17 December 2014. ^ "Skt. Ibs Kirke i Roskilde" (in Danish). Kulturarv. Retrieved 17 December 2014. ^ "Roskilde Sankt Jørgensbjerg kirke" (in Danish). Nordens Kirker. Retrieved 18 December 2014. ^ "Sct. Jørgensbjerg Church". Visit Roskilde. Retrieved 18 December 2014. ^ "Sankt Laurentii Kirke – Roskilde" (in Danish). Den Store Danske. Retrieved 22 December 2014. ^ "Skt. Laurentius (St. Lawrence) Church". Visit Roskilde. Retrieved 22 December 2014. ^ "The Roskilde Jars". Visit Roskilde. Retrieved 11 January 2015. ^ "Vandskulpturer Roskildekrukkerne" (in Danish). Kunst i Roskilde. Retrieved 11 January 2015. ^ Mikael 2004, p. 285. ^ "Roskilde Festival". Visit Roskilde. Retrieved 8 January 2015. ^ "Roskilde Festival". Archived from the original on 7 February 2006. Retrieved 19 February 2006. ^ "Dyrskuepladsen i Roskilde" (in Danish). KultuNaut.dk. Retrieved 8 January 2015. ^ "Roskilde Universitet" (in Danish). Den Store Danske. Retrieved 19 December 2014. ^ "Skolens historie" (in Danish). Roskilde Katedralskole. Retrieved 7 January 2015. ^ "Vocational Training of the Food and Service Industry". Slagteriskolen. Retrieved 7 January 2015. ^ "Slagteriskolen" (in Danish). Den Store Danske. Retrieved 7 January 2015. ^ D'Atri, Marco & Braccini 2010, p. 6. ^ "Overbygningen FC Roskilde" (in Danish). FC Roskilde. Retrieved 9 January 2015. ^ "Velkommen" (in Danish). Vor Frue Idrtsforening. Retrieved 9 November 2015. ^ "120 år og i topform" (in Danish). Roskilde Avis. 21 January 2011. Retrieved 9 January 2015. ^ "Roskilde Kongres- & Idrætscenter" (in Danish). Den Store Danske. Retrieved 9 January 2015. ^ "Train and bus information in Roskilde". Visit Roskilde. Retrieved 14 January 2015. ^ a b "Roskilde Airport". Airportsworldwide.com. Retrieved 9 January 2015. ^ "Roskilde Airport". Airportsworldwide.com. Retrieved 9 January 2015. ^ Lars Kimer (27 December 2013). "Flyvestation Skalstrup kan være lukket inden 2018" (in Danish). SN.dk. Retrieved 9 January 2015. ^ "Roskildge Sygehus" (PDF) (in Danish). Roskilde Kommune. Retrieved 14 December 2014. ^ "Fakta: Her kan du finde fakta om Roskilde Sygehus" (in Danish). Roskilde Sygehus. Archived from the original on 24 September 2015. Retrieved 14 December 2014. ^ "Side 1 Sygehusprofiler 2012–2020" (PDF) (in Danish). Region Sjælland. 3 July 2012. Retrieved 14 December 2014. ^ "Roskilde Sygehus" (in Danish). Roskilde Sygehus. Archived from the original on 17 December 2014. Retrieved 14 December 2014. ^ "Mental Health Centre Sct. Hans". Psykiatri Region H. Retrieved 22 December 2014. ^ "Nielsen Hatt, Anders" (in Danish). Kunstindeks Danmark & Weilbachs Kunstnerleksikon. Retrieved 18 December 2014. ^ "Ejler Andreas Jorgensen". Ask/art. Retrieved 11 December 2014. ^ "Stifter forening for at købe L. A. Rings atelier" (in Danish). sn.dk. Retrieved 11 December 2014. ^ "Den danske film database" (in Danish). Retrieved 6 May 2015. ^ "Thomsen, Pauline" (in Danish). Dansk kvindebiografisk leksikon. Retrieved 11 December 2014. ^ "Gustav Wieds hus i Roskilde" (in Danish). Kulturstyrelsen. Retrieved 11 December 2014. ^ "Aksel Schiøtz og Roskilde" (in Danish). Schubert Selskabet. Retrieved 11 December 2014. ^ "Oplev Lise Nørgaards Roskilde" (in Danish). Visit Roskilde. Retrieved 11 December 2014. ^ "Jørgen Boberg er død" (in Danish). Berlingske. Retrieved 11 December 2014. ^ "Ib Michael" (in Danish). Literatursiden.dk. Retrieved 11 December 2014. ^ "Man skal Thure noget" (in Danish). Berlingske. Retrieved 11 December 2014. ^ "Absalon (c. 1128–1201)" (in Danish). danmarkshistorien.dk. Retrieved 11 December 2014. ^ "Louis Pio" (in Danish). Gyldendal. Retrieved 12 December 2014. ^ "Carl Theodor Zahle, konseilspræsident" (in Danish). Københavns Befæstning. Retrieved 11 December 2014. ^ "Mette Gjerskov" (in Danish). Folketinget. Retrieved 12 December 2014. ^ "Rasmus Bartholin" (in Danish). Gyldendal. Retrieved 11 December 2014. ^ "Kornerups billedverden – Roskilde. rejser og restaureringer" (in Danish). Roskilde Museum. Retrieved 11 December 2014. ^ "Ejnar Hertzsprung" (in Danish). Encyclopædia Britannica. Retrieved 11 December 2014. ^ "Thomas Ebert" (in Danish). Guldfireren. Retrieved 12 December 2014. ^ a b "Kevin Magnussen vil altid vinde: Havde ingen venner som barn" (in Danish). BT. Retrieved 12 December 2014. D'Atri, Alessandro; Marco, Marco De; Braccini, Alessio Maria (27 July 2010). Management of the Interconnected World: ItAIS: The Italian Association for Information Systems. Springer Science & Business Media. ISBN 978-3-7908-2404-9. Wiberg, Mikael (31 October 2004). The Interaction Society: Practice, Theories and Supportive Technologies: Practice, Theories and Supportive Technologies. Idea Group Inc (IGI). ISBN 978-1-59140-532-0. Porter, Darwin; Prince, Danforth (13 August 2009). Frommer's Denmark. John Wiley & Sons. ISBN 978-0-470-50290-7.